C’mon, Who Really Wrote it? : Andrew E. Svenson in 1966. Two years before he revised 7: THE SECRET OF THE CAVES. Four years later he revised 23: THE MELTED COINS. I was a fan of #23, not so much #7, but I chalked that up to these being revisions. From 1949 to 1951 he wrote three originals in 28: THE SIGN OF THE CROOKED ARROW, 29: THE SECRET OF THE LOST TUNNEL, and 30: THE WAILING SIREN MYSTERY. Those got two 7s and a 6. Finally, we will encounter Svenson originals in #48, #50, #52, #53 and #54. Basically, Mr. Svenson is one of the giants of the Hardy Boys writing business, involved in the process off and on from 1949 to 1975. What score will this one get? Cover: Rudy Nappi. If you’ve been paying attention, you’ll know what I think of this cover for this forms the logo of this site. 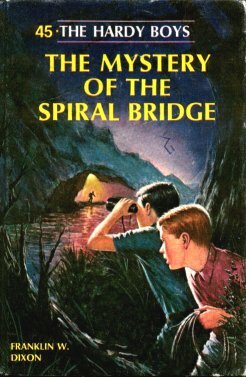 That’s right, this is — by far — my favorite Hardy Boys cover. The classic elements are in pace with Frank and Joe peering at danger. Joe has his red shirt, the yellow is in the title, and it’s a night scene which remain my favorite. But what makes this cover soar is the red, orange, yellow shading of Rosy. It’s absolutely beautiful. An outstanding cover. Setting: Bayport, New York City, and then Kentucky. Where’s Fenton This Time? : In the hospital. The entire time. Which Chums Show Up? : Everybody. Chet, Biff, Tony, Phil, Callie and Iola. The gang’s all here (I consider Jerry to be a bench part of the gang, not in the starting lineup), and almost all of them take important parts in the plot. What’s Chet’s Hobby This Time? : Shot put. Yes, so that it can come in handy at the end. Aunt Gertrude’s Dessert: Nothing. The only thing that keeps this book from being perfect is the lack of a chocolate cake from Aunt Gertrude. Plot: Fenton Hardy is investigating sabotage on a road building project in Kentucky when he is captured by some crooks, tortured, and winds up unconscious in the hospital. It’s up to the boys to go down to Kentucky and stop the sabotage and figure out why the crooks want to stop the road being built. And what’s with that spiral shape? Review: Perfection (minus a chocolate cake, although given the seriousness of the story, it’s understandable why Svenson didn’t include such a scene). There is real emotion from real characterization. How could you not feel something for poor Laura? The inciting incident is real and powerful. There is time later in the book for the boys to have an actual scene of pure fun when the gang heads down to a recreation room to play pool and ping-pong. I always like it when they hang out and do fun things as a group. Current culture is referenced when Tony jokes about Chet being secret agent 008. In 1966, James Bond was as big as he ever got in the popular culture, and this book acknowledges that. The mystery is hard to figure out. You want to keep reading to understand what is going on. No Fenton rescuing them in this one; this is the boys rescuing Fenton, so to speak. They act very grown-up in this one.